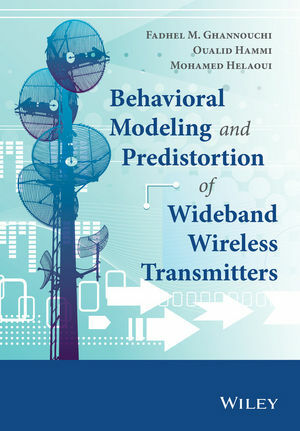 Behavioral Modeling and Predistortion of Wideband Wireless Transmitters covers theoretical and practical aspects related to the behavioral modeling and predistortion of wireless transmitters and power amplifiers. It includes simulation software that enables the users to apply the theory presented in the book. In the first section, the reader is given the general background to nonlinear dynamic systems along with their behavioral modeling from all aspects. In the second part, a comprehensive compilation of behavioral models formulations and structures is provided, including memory polynomial based models, box oriented models such as Hammerstein-based and Wiener-based models, and neural networks-based models. The later chapters focus on practical applications of the theory and knowledge presented earlier on, together with a thorough description of practical approaches for power amplifiers characterization, behavioral model identification, and digital predistortion. Advanced topics such as joint quadrature impairments compensation and digital predistortion, as well as digital predistortion of MIMO, and concurrent multiband systems are covered in the last chapter. The book will be a valuable resource for design engineers, industrial engineers, applications engineers, postgraduate students, and researchers working on power amplifier modeling, linearization, and design.